Samsung Galaxy Note 5 is one of the most successful smartphone of Galaxy Note series. It was released back in August 2015. People who are obsessed with S pen are still happy with the Samsung Galaxy Note 5. Just today, Samsung has started releasing OTA updates for Android Nougat on Galaxy Note 5. If you can’t wait for the update, follow the guide below to update note 5 to Android Nougat 7. Note 5 comes with an S-pen. It has a sleek and stylish design. Note 5 also supports wireless charging. The display screen is Quad HD super AMOLED of 5.7 inches. It is running on Samsung’s Exynos 7420 supported by 4GB of RAM. In December 2016, Samsung started the beta testing program on Galaxy S7 and S7 edge to test Android nougat on their devices. After weeks of testing, an official version was released for Galaxy S7. Gradually, other devices like Galaxy S6 and S6 Edge+ also started getting the Nougat update. Now the turn of Galaxy Note 5 has arrived. The first news on Android Nougat on Note 5 comes from Turkey. Where people can now update Note 5 to Android Nougat 7 via OTA updates. It sometimes takes months to cover all the countries with OTA updates. So if you can’t wait, then use the guide below to update Note 5 to Android Nougat. In this method, we will be using Odin to flash the latest firmware on Samsung Galaxy Note 5. Update: Galaxy Note 5 Nougat update rolling out in multiple countries Middle eastern countries. Now it is released in almost every country around the world. If your Note 5 still does not have OTA update of Nougat. Make sure it is not rooted. Also Checkout: How to Record Unlimited 4K Video on Note 5. Although the process below is simple and via the official tool of Samsung to flash firmware, it is not the official way. The official way to update Note 5 to Android 7 is via OTA updates or by using Smart Switch. If you can’t wait for OTA then use the guide below to flash Android Nougat on Galaxy Note 5. Goto Settings -> About Phone -> Tap on Build Number for 7 Times. Now, go back to Settings -> Developers Options. Locate and Enable USB debugging. For Galaxy Note 5 SM-N920C. 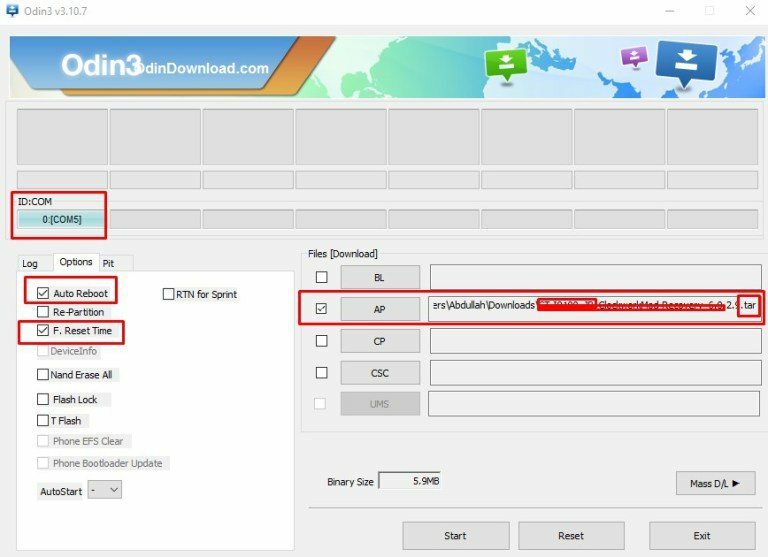 Download the firmware from here. Users of Galaxy Note 5 SM-N920G. Download the firmware from here. For other versions of Note 5. Search for the model of Note 5 here and locate the Android Nougat firmware respective to your Note 5 model. Download the firmware from above. Most of the above firmwares are unbranded and will run with any unbranded Samsung Note 5. Make sure your phone is unlocked not branded with any carrier. The links above are from Sammobile, most reliable to download firmwares for Samsung mobiles. Turn off KIES on your PC. Perform clean flash. It is recommended (not essential) that you factory reset your phone before flashing new firmware. Note for Pros: If you don’t want to perform a factory reset and lose data. Although factory reset is recommended before flashing new firmware to get the best experience. Download firmware that you are using right now on your phone. Use its HOME_CSC file instead of CSC file from the downloaded firmware in ODIN. First of all, download ODIN on your PC. Install Samsung USB drivers for windows on your PC. Download the right firmware for your phone and extract it on your desktop or anywhere it is easily accessible. Extract the .zip file to get .tar or .tar.md5 file. Now turn off your Galaxy Note 5. Press Volume Down, Power button and Home Button simultaneously. Keep on holding buttons till you see a warning. Connect your Galaxy Note 5 with your PC via data cable. The ID:COM section on ODIN will turn blue, like in the screenshot below. It is an indication that the PC has recognized your device. After that, locate and select the firmware you downloaded for your phone. Make sure only Auto Reboot and F. Reset Time are checked in the options. DO NOT CHECK REPARTITION. Now, wait for 4-5 minutes. Don’t disconnect your phone from your PC while ODIN is flashing because it can brick your phone. Wait even if it takes time. Finally, when the flashing will complete your phone will reboot. And it will be running on Android Nougat 7.0 version. After the flash, it takes about 7 minutes to reboot. Do not panic and try to restart or shutdown your phone. That’s all, If you have any questions or queries regarding how to update Note 5 to Android Nougat 7. Let me know in the comments. Do share your experience after you update note 5 to Android Nougat. Experience of the latest update is great on Galaxy S7 and S6. Do let us know about Note 5.